I was recently staying with ITC Maurya in Delhi. As the name suggests the hotel is inspired by the Mauryan Dynasty and particularly the Emperor Ashoka! 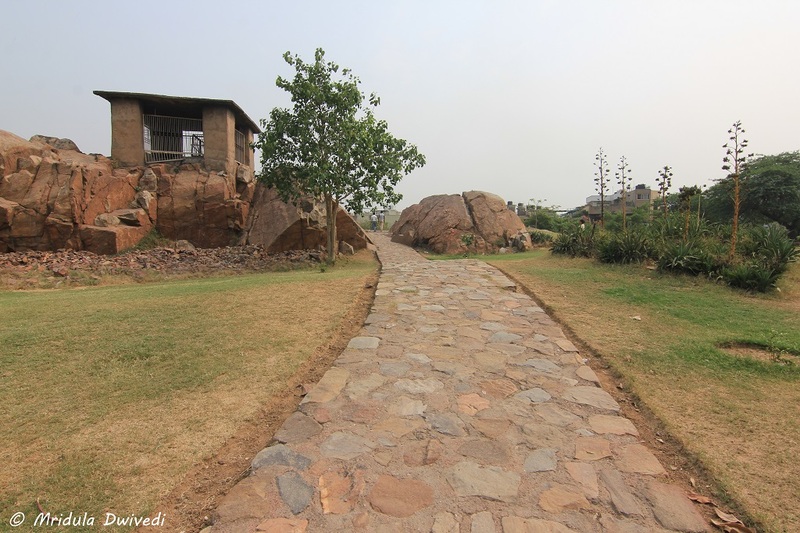 They took us on a visit the Ashoka Rock Edict in Delhi! The place is close to the ISCON Temple at East of Kailash. 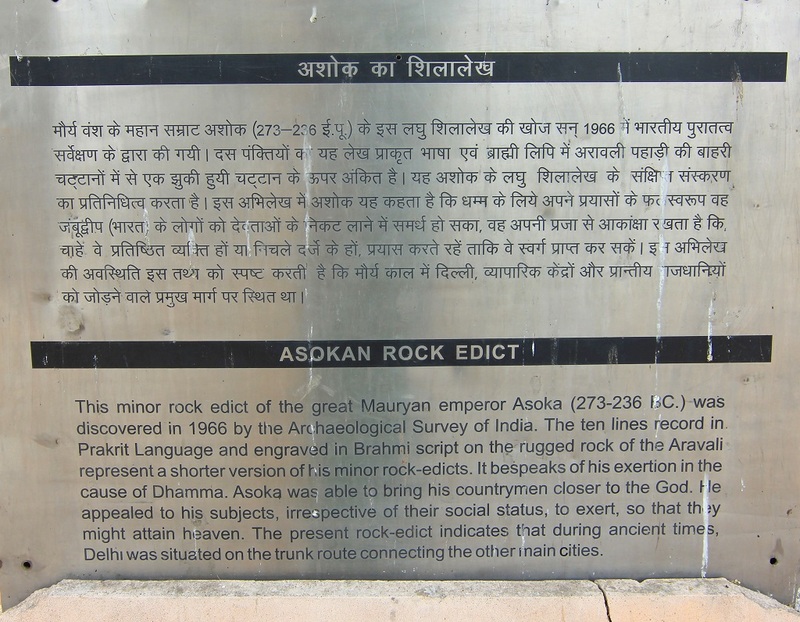 If you search ‘Ashoka Rock Edict Delhi’, you get the location on the Google Maps too! But as we did not know what to search for, we had some trouble finding the historical site. There are absolutely no signposts around! There was no board outside. The place is set in a large garden. There are rocks strewn at one side. We started walking towards them! A security guard materialized out of nowhere but he didn’t say much to us. He only pointed out the path leading to the rock! The Cowshed Like Structure that Protects the Ashoka’s Rock Edict! I was completely aghast the way the rock edict was protected. If I did not know, I would think I was looking at a cowshed! The concrete structure was so ugly, it is in no way befitting to the great king Ashoka! The iron grill add nothing to the history. At the best it looks like a cowshed or a storage facility! That it hardly gets any visitors is not surprising! In any country that took pride in its history, such a place would have have been preserved with pride and showcased well. Don’t get me wrong I perfectly understand the need to protect the rock edict. Otherwise the scribbling gang would descend on it and deface it beyond recognition. But who in their right mind would approve such an ugly structure over an important piece of history? The Signboard within the Premises! There is a signboard inside the premises which also gives us the history of the rock edict. 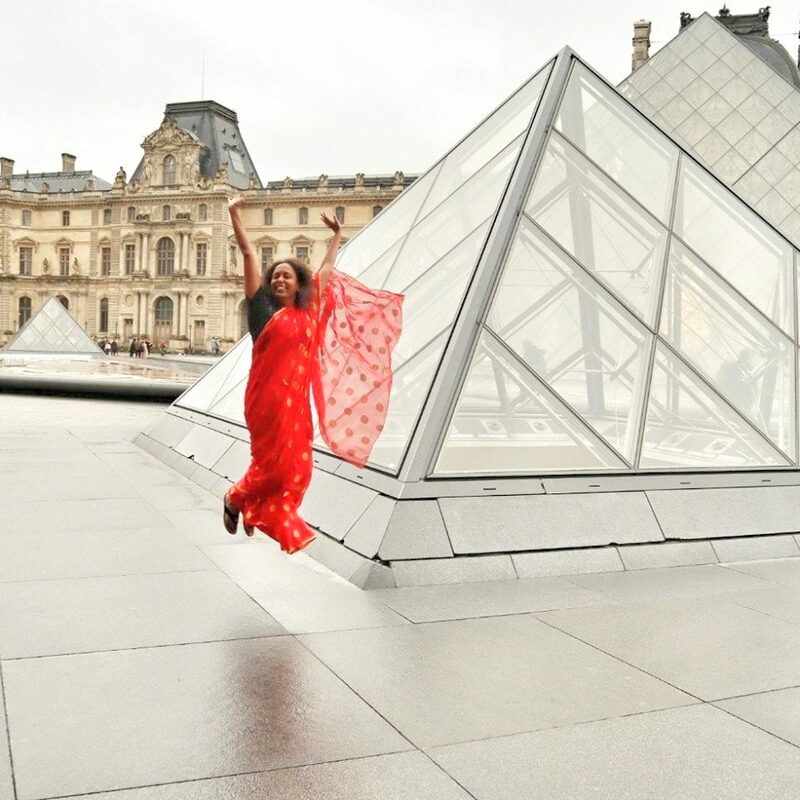 But seriously I cannot get over the fact that someone ordered such a shabby structure over an important historical monument from the time of the great Mauryan Emperor Ashoka! PS. My trip to Ashoka Rock Edict was sponsored by ITC Maurya but the views expressed here are entirely my own!